One of the upsides of fountain pens is that you can use any kind of colour in your favourite pen. And fountain pen inks come in a whole spectrum of colours with special properties like shading, sheen or shimmers. Since it’s the holiday season I want to highlight the shimmering inks, one that leaves a trail of glitter on the paper as you write. I should mention that you should only use inks that are made for fountain pens, and no Indian ink or calligraphy ink as they will clog up your pen. Diamine is a British fountain pen ink company that as a large range of colours in both their shimmering inks as the regular inks. For some holiday inspiration, I suggest Magical Forest, Red Lustre, Moon Dust, Firestorm Red, and Golden Sands. A green, two reds, a gold and a silver. These are great for a festive mood, but they are still great colours outside of the holidays as well. I love the Diamine Shimmering Inks. I have Blue Lightning and Magical Forest myself (Firestorm Red is on its way), and the sparkle is amazing. Make sure to shake the bottle before inking and roll your pen around in your hand before writing to loosen up the particles. Your writing will be filled with glitters! De Atramentis is a German brand that has different lines for each of the different shimmering colours. All of them have the same base colour, but a different shimmer. They have a choice of gold, silver, and copper shimmer. There are seven base colours for the Pearlescent line. They also have other shimmering inks in their normals lines as well. 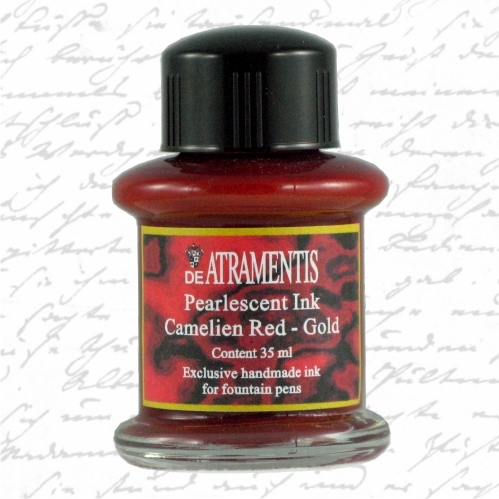 I don’t have any hands-on experience with the Pearlescent inks, but I love the De Atramentis inks. They flow well, even in a fine nib. Their colours are vibrant and deep. This Australian brand has the most amazing colours. Not all of them are shimmering, but all of them are unique. Robert Oster Signature uses the Australian countryside to inspire their colours. They’re more subdued than Diamine or De Atramentis, but I love that variety in inks. They’re high-quality inks that will surprise you with shading or a sheen hiding in the edges. I want to highlight these festive colours Red Gold, Heart of Gold, and Peppermint Candy. A red, a gold and a green. Red Gold is a bright red with tons of golden shimmer. It pops out on any card you sign. Heart of Gold might be the perfect golden ink. It’s a perfect mix of yellow and brown with a golden shimmer. Peppermint Candy has a green shimmer in it, so it’s not as eye-popping as the others, but that’s what I like about this one. It’s subtle, but still special. These three inks were in a limited edition for the holiday season last year so they might be harder to find, but it’s definitely worth it. Colorverse is a Korean brand of fountain pen ink and they pull their inspiration from science. They name their colours after particles, scientists, astronauts and other physics related subjects. All of the inks have two bottles, a large 65 ml ink bottle and a small 15 ml bottle. Most sets have two colours, some have the same colour as a sample. It’s hard to recommend any particular ink from their line up since their all great. For the festive colours I want to highlight Gravity Waves and Andromeda. They’re not the typic bright red and green as some of the other colours I picked, but these are favourites in the community and do fit the theme. 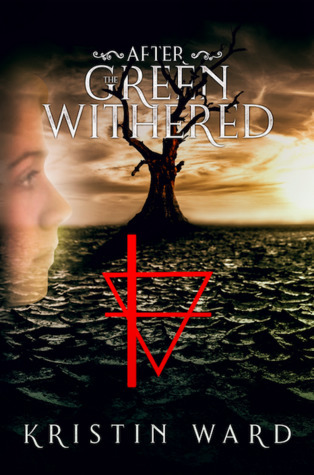 Gravity Waves is a green with red sheen and reminds me of the Kind of Shimmer (see below). 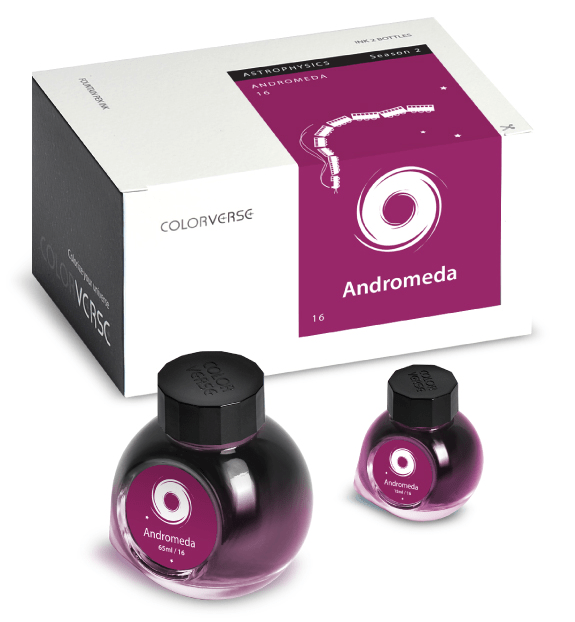 Andromeda is actually a fuchsia colour with dark golden sheen. The saturation in the fuchsia colour makes it appear red on parts and the sheen is heavy enough to appear shimmering. The Colorverse bottles are neatly packed and it already looks like a gift. It’sone of the more expensive inks, but it’s a high-quality ink for sure. Receiving a Colorverse set is never a disappointment for any fountain pen lover. 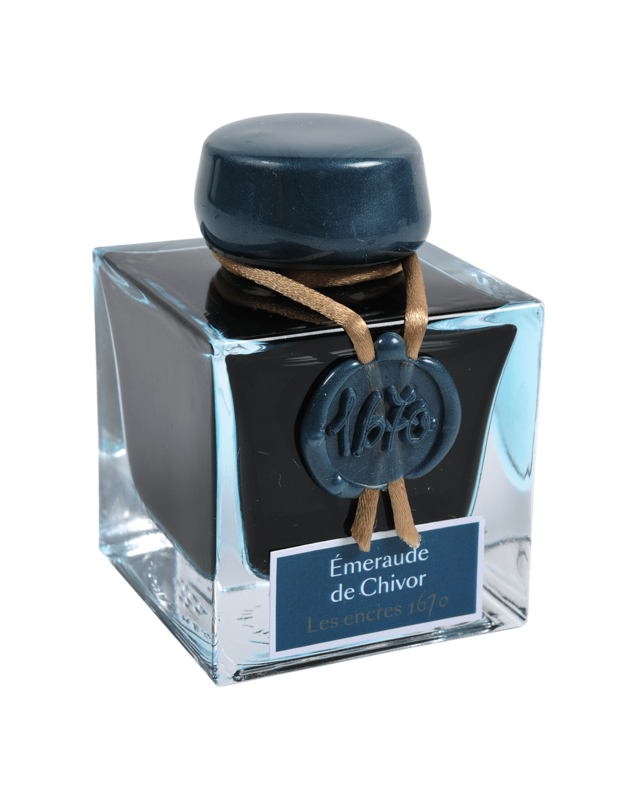 There’s one ink that’s regarded as the best ink with shimmer and sheen, and that’s Jacques Herbin 1670 Emerald of Chivor. It has a red sheen and gold shimmer in the otherwise blue-green colour. It’s definitely on my wishlist and I’m sure it’s on the wishlist of many others. 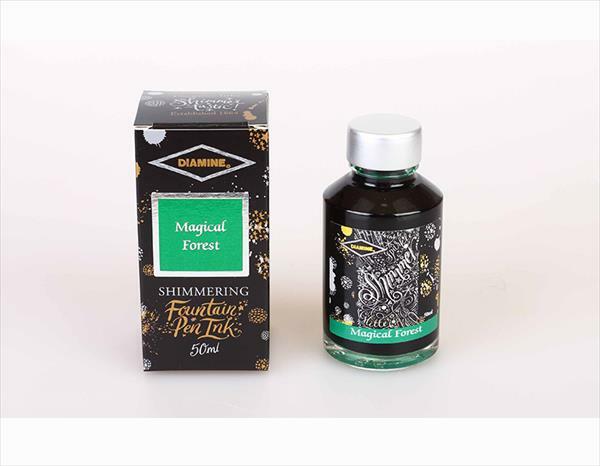 If you want to know more about shimmering inks, want to see beautiful swabs or find other brands with tons of glitter, I suggest you check out this page by Mountain of Ink. They give a great overview of shimmering inks and divide the inks they review into categories of the colour of the shimmer. Which shimmering ink are you hoping to get this holiday? My handwriting is so bad that having this kind of pen would be useless. Fountain pens are a great way to work on your handwriting if you do want to improve it. My handwriting became noticeably better when I started using one, almost instantly 🙂 Maybe a better alternative would be a metallic gel pen? They’re also available in great colours with sparkle! These inks sound amazing! I’ve been wanting to practice calligraphy more so these inks sound like such a great way to leave a special touch in a card or a piece of artwork.